I'm not OCD however I am OCD about certain ridiculous things. The biggest thing is my skincare routine. I don't care how late I'm running I ALWAYS make time to wash my face morning and night. The Husband thinks I spend a little too much time on this but it's my thing! Everyone has a thing right? Today I'm going to take you through the steps with each product I use for the morning. Step 1: Start by cleansing, I use Cetaphil for normal to oily skin. Step 2: I either exfoliate everyday with the clarisonic using the radiance brush head ( It's gentle) or I use the St. Ives Green Tea scrub every other day OR I use the Sensitive Clarisonic attachment twice a week. When I use the Clarisonic I use the cetaphil on the brush combining step 1 and 2. Exfoliating is my favorite but you don't want to do it too much. Everyone's skin is different so pay attention to what works for you! Step 3: I use an astringent with a cotton pad to wipe away oils, this includes my neck and décolletage. I really like using Eskinol(not pictured) which can be found online or sometimes at asian markets. Step 4: Essence is my newest addition and I'm never going back. I put 2 or 3 drops(I'm stingy) in my hand and pat my face with it. My complexion has evened out and I feel more confident with my naked face since starting this. The SK-II was a splurge but I had tested it from a large batch of samples I bought from sephora and knew I was hooked! Step 5: Another product I instantly could feel the difference as I used it was the Caudalie Radiance Serum. I had ordered a new bottle before I ran out of the sample size, I think it's safe to say I'm addicted! Step 6: Under eye cream has helped me with plumpness and anti aging specifically targeting that area. I use the Innisfree brand, I like it BUT it has a very strong scent so keep that in mind if you aren't into that. Step 7: FACE CREAM!!!! I don't care what you use but anything is better than nothing! I ran out of my Belif Aqua Bomb moisturizing gel which I LOVE and I started using the Laniege water bank moisturizing cream I love it too!!!! I will probably keep both on hand and alternate depending on what I feel my skin needs that day! I don't want to jump the gun since I've only used it for a week but so far my favorite face sunscreen has to be Origins A Perfect World SPF 40. It's anti aging so sign me up but it isn't a weird thickness and doesn't smell strongly which I like! I'm still testing it and I was't going to say anything but it has impressed me thus far! I know that seems like a lot but like I said I'm a little obsessed! 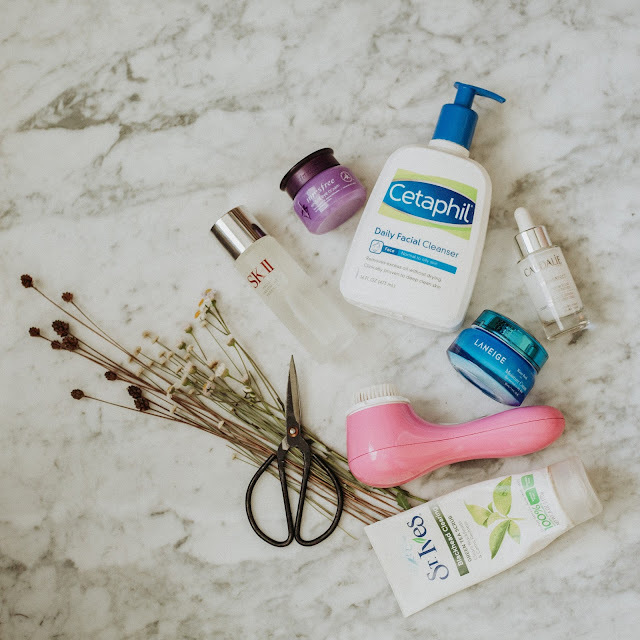 If you don't have a favorite moisturizer and you want something inexpensive to get you started, Olay is my go to brand to suggest. My first moisturizer was the Olay firming night cream and I still love it! Don't forget to DRINK WATER, I drink about 2 quarts a day. It's never too early to start skincare and it's never too late either. My husband asked how much "younger" I wanted to look by doing all of this, my answer is simple, I'm not trying to look younger I'm starting the foundation to aging gracefully. and I hope you found this little morning routine helpful or at least fun! Let me know if you have any good skincare suggestions for me in the comments below!